When babies are first born, they see in black and white. This is why the Musical Inchworm strikes a balance between bright, high contrast patterns that help stimulate baby's vision, and bold solid colors that give baby's eyes a place to rest. Sounds like rattle, squeak, crinkle, and jingle also help stimulate and develop baby's auditory skills. Finally, the Musical Inchworm's large, friendly eyes invite baby to focus and stare at a single object, which can help calm baby while supporting healthy eye development. 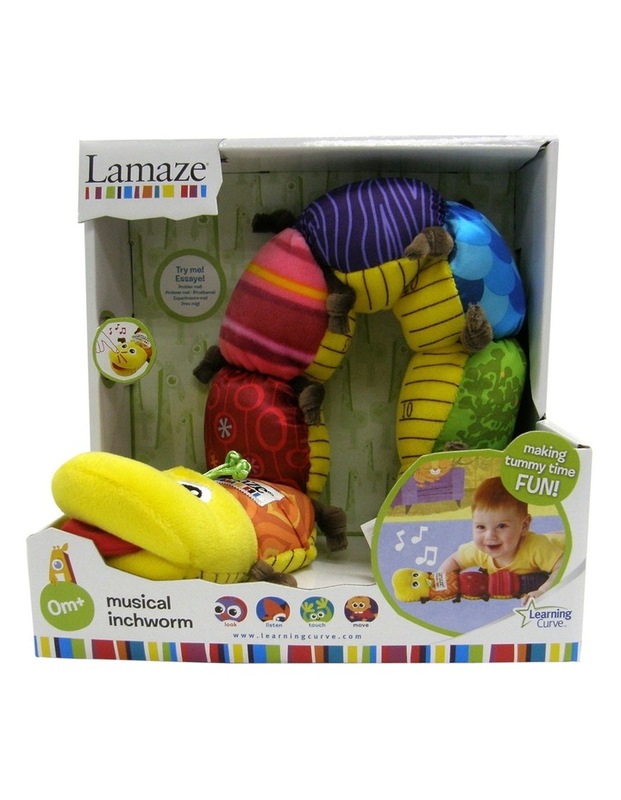 Child-Safe Design With its soft velour body and interesting textures to touch and chew, the Musical Inchworm is an ideal play and rest-time companion, whether baby is at home in his crib or traveling in the car. Safe and easy for little hands to hold and investigate, this toy also features an underside that measures your baby up to 24 inches. Perhaps the most rewarding feature of the Musical Inchworm's design, however, is the bonding opportunities it offers. In fact, this toy is perfect for an interactive game of peek-a-boo--simply hide the inchworm's head underneath a blanket and then show the baby the inchworm as you say "peek-a-boo!"